Window Washing Albuquerque by We Do Windows! There is a simple, scientific reason for the appearance of no glass. The visual mechanism between the eyes and brain is extremely sensitive and will detect the slightest film on the glass surface, which brings our focal plane to the glass instead of our views. Hence when the glass is cleaned properly, our attention returns to the views outside. Most new homes have a large number of windows to capture our incredibly beautiful New Mexico vistas and wide open skies. For this reason, we take our job very seriously. It is our duty to ensure that our customers enjoy their views, not the glass! Our business is family owned and operated, and we serve the greater Albuquerque area including the far northeast heights, Corrales, Rio Rancho, Placitas and the East Mountains. We occasionally take jobs in Santa Fe and other outlying areas. 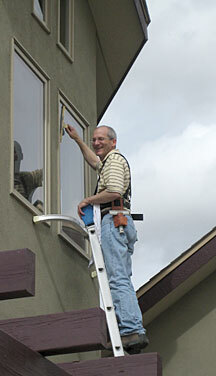 We are New Mexico's residential window cleaning experts! We welcome large and hard-to-reach windows. Call or email us for a free estimate! Click here to print a coupon for our our introductory offer!